In the beautiful Italian region of Cinque Terre, Peter and I strolled the Via Dell’Amore, also know as Lover’s Walk. Along this romantic seaside path there were padlocks attached to the chain linked fences, a place where couples could bring their own locks to secure their love. I didn’t have a padlock at the time, so we did not lock our love in Italy. That wasn’t going to happen in Paris. 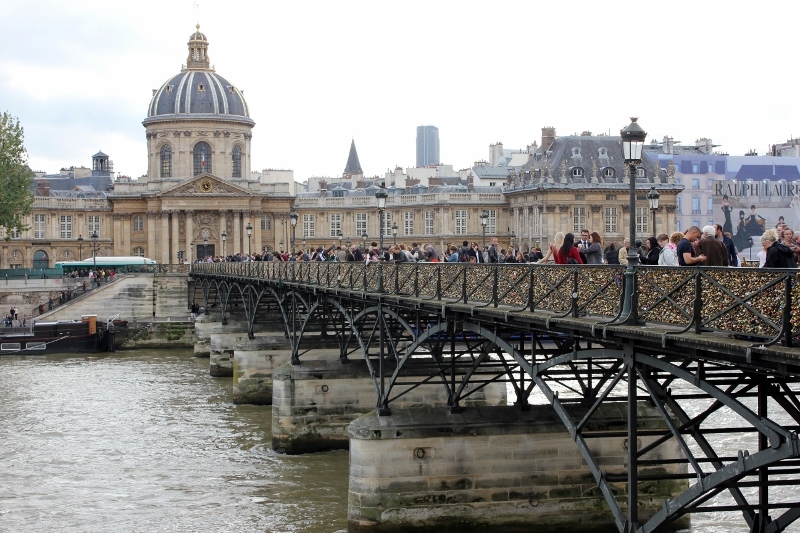 The Paris Pont des Arts bridge, near the Louvre, has love locks too. Thousands of them. Many more than I ever saw along the Via Dell’Amore trail. 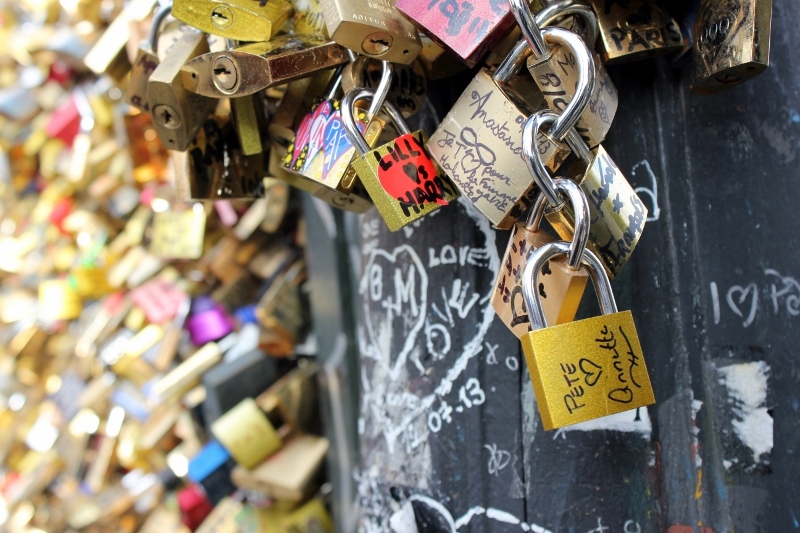 Apparently, everyone wants to lock their love in one of the most romantic cities in the world. Me too. We bought a small gold lock, which had three keys attached, for five euros from a brilliant vendor who stood at one end of the bridge. The merchant even supplied a selection of colored markers to write our tender message with. I penned a simple Pete ❤️ Annette. Pretty standard stuff. That’s about as romantic as we get. 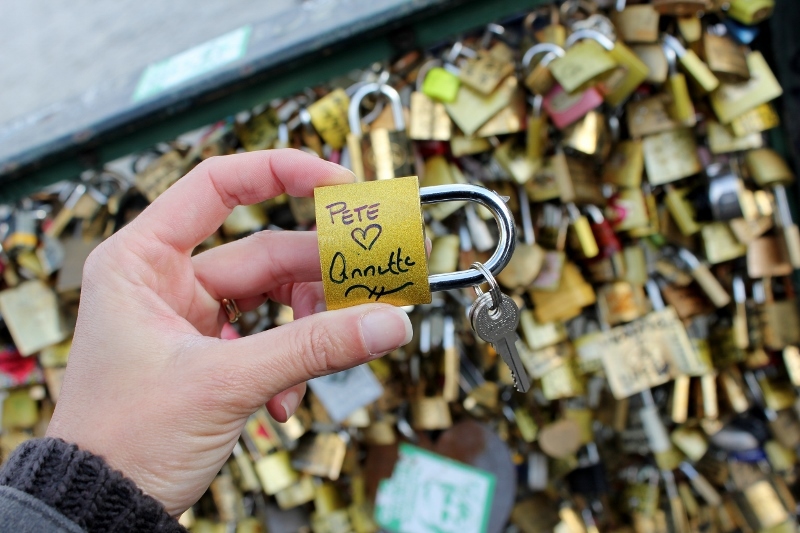 There were clusters of locks clipped to almost ever nook on the Pont des Arts bridge, which made it hard to find the perfect location to secure our devotion. After pacing up and down the bridge a few times, I ended up selecting a spot that was not on the chain portion of the fence, instead it was attached to another padlock, so it perfectly dangled. We then threw our 3 keys that came with the lock into the Seine river, so the lock could never be reopened, securing the love forever. I double checked Pete’s hands to make sure he actually tossed the key into the water and didn’t stick it in his back pocket. Our love is now officially locked. At least in Paris. I love these bridges! My friend did this in Italy as well. It’s such a beautiful, romantic idea 🙂 Love the lock too! THIS is what I need to do next time I’m in Paris 🙂 My fiancee has never been to Europe, I want to bring him! I was in Paris for a few days. The photo of the bridge and architecture reminds how impressed I was. It was my first time in Paris and I definitely was in awe of the architecture. So beautiful! I have seen this bridge! Beautiful and quite romantic. Unfortunately I was there alone. MAYBE one day I can travel back there with a special someone! Paris is first on my bucket list on 2014. Will surely get to lock ours too. Cool place! Paris is a GREAT place to be on your bucket list! This is actually vandalism and is enforced by the Paris authorities. 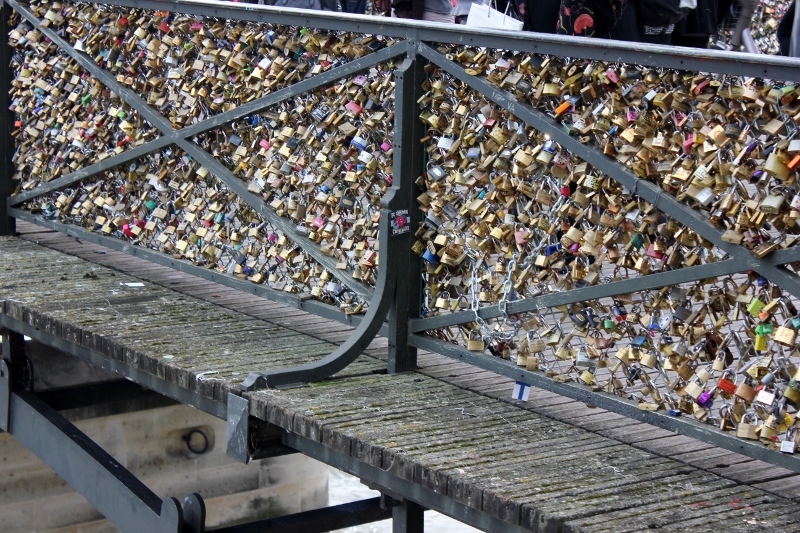 If you wouldn’t spray paint the bridge, don’t leave a padlock on it. It’s destructive to the property and is encouraging expansion of this practice to monuments like the Eiffel tower. The local authorities have already boarded off the Pont des Arts area because the locks are causing structural problems for the bridge. I am going to be in Paris in August 2018 Where can I see a bridge that has locks on it? I looked online to find out but it looks like they have stopped this and took all the locks off bridges. They have been removing all the love locks from the bridges, so I don’t believe there are any anywhere in Paris.